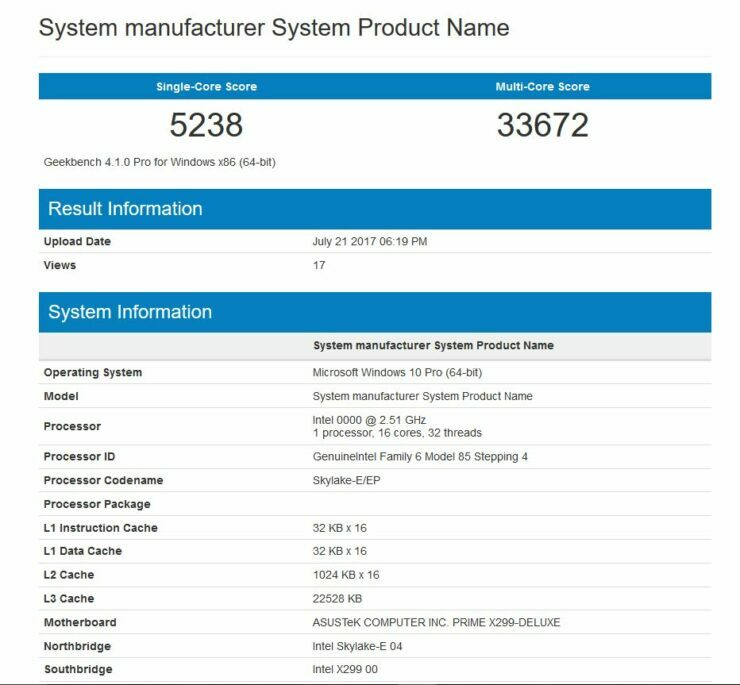 Geekbench score of the upcoming Intel Core-i9 7960X has leaked out and shows impressive performance from the 16 core part that will go head to head with AMD’s Threadripper 1950X flagship. The HCC (High Core Count) part from Intel is slated to arrive sometime later this year and will be fully compatible with the X299 platform for Skylake-X. It will have an MSRP of $1699 – which is pretty damn high for a part like this. The processor scores 5238 points in single core results and 33672 points in the multi core results. 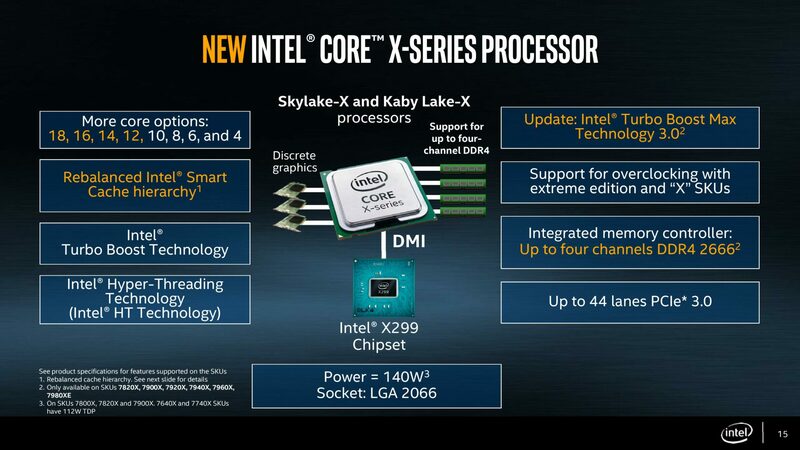 While these would be very impressive numbers for any other chip, these are much lower than expected for the 16 core part. In fact, if you take a look at the scores earned by the Core i9-7900X (which is a 10 Core / 20 Thread part) you will see similar performance in almost all categories except the Floating Point and Memory category. The reason for this is obvious – the chip appears to be clocked at 2.5 GHz, which is a very low clock even considering this is a 16 core part. As you can see Core i9-7900X currently leads the charts in terms of performance per $ (as far as Geekbench v4.0 result goes). Keep in mind however, that these results are very different from compute benchmarks such as the Cinebench R15 where the Threadripper parts vastly outperform Intel’s. In those scenarios, AMD parts are roughly 40% better performance per dollar based on Cinebench numbers for the AMD Threadripper parts. Since a very large market exists for rendering applications for these chips, they are going to sell like hot cakes. AMD has indeed brought the world of high core count CPUs into the hands of the average consumer. The Core i9-7960X however, has an absolutely abysmal price/performance ratio at these numbers. The only explanation for this score is that this is an engineering sample and judging from the 2.5 GHz clock rate – that seems very probable. A clock rate increase (all-core) of 500 MHz is expected at the very least if the final retail versions are to have any hope of a meaningful value proposition. You can check out the complete Geekbench score over here.